From the Windows desktop, navigate Start > (Settings) > Control Panel > (Network and Internet) > Bluetooth Devices. 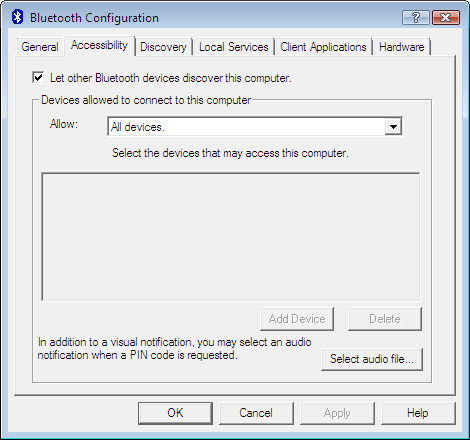 If using Windows 8/10, navigate: Right-click Start > Control Panel > In the search box, enter "Bluetooth" then select Change Bluetooth settings. If using Windows 10 Tablet mode, navigate: Settings icon (located in the lower-left) > Devices > Bluetooth. From the Options tab, ensure the following are selected (checked) then click OK.
Don't miss a beat! Find the perfect headset or portable speaker in our accessory store. From the Windows desktop, navigate Start > (Settings) > Control Panel > (Network and Internet) > Bluetooth Configuration. If using Windows 2000 / XP, navigate Start > (Settings) > Control Panel > (Network and Internet Connections) > Bluetooth Configuration. 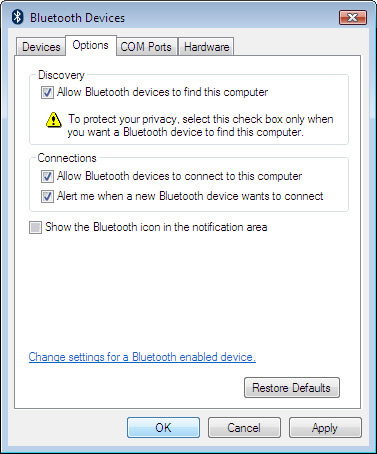 From the Accessibility tab, ensure that Let other Bluetooth devices discover this computer and All devices (in the Devices allowed to connect to this computer section) are selected then click OK.